﻿ How to write a resume? Writing or updating your resume can often seem like a daunting task, especially if haven't done it in a while. But, don't worry, we're here to help. So, what should be included in your resume? Your heading should be your name. Make it big so it stands out. Under your name we recommend including your phone number, email and permanent address. This is your time to shine! Use this section to briefly highlight your best attributes and accomplishments - it's basically a way to 'sell yourself' to a potential employer and make sure your resume gets noticed! If your education is directly related to the role you're applying for, keep it close to the top of your resume. If not, it can sit under the work experience section. This is where you list your past jobs and what you achieved at those jobs. Be sure to talk about your accomplishments, rather than listing your tasks and duties. If you are trying to get your first job, it's a good idea to list any volunteer or unpaid work you have done that may be relevant to the role you're applying for. If you have referees (i.e. managers or colleagues from past jobs) who are willing to vouch for you as an employee, you can put them down here. If you'd rather not include them (and wait until the employer requests them) there's no need to include this section. With so many sites out there offering advice on what a successful resume should look like, it can be easy to get confused! 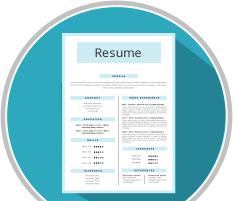 So, we've done the hard work for you, and sifted through all the information to compile a list of 6 simple dos and don'ts that will be sure to make your resume stand out. DO tailor your resume to each job. Show the employer that you have thought about the role and why you're the best person for the job. DO be as specific as possible. Let the employer know exactly what you have done in your past jobs. For example: "team management" could be: managed a team of 6. DO check your resume for spelling, formatting and consistency. It will make it much easier for the employer to read and will come across a lot more professional. DON'T include irrelevant or outdated information. The key here is to keep it professional not personal! Limit information to just your relevant work history, and leave all the other bits out. DON'T be vague. You know better than anyone what you have done in your previous jobs, but a potential employer doesn't, so make sure you present the information in a way that is clear, concise and gets your point across. DON'T use a personal email address if it's not entirely professional. For example: "jessicarabbit4real@" may not exactly send the right message to a potential employer, so, when in doubt, keep it simple! Stick with the classic format of Firstname.Surname@emailprovider.com. How about you have a go at writing your own resume with our sample resume template? Good luck!